Pull the lever to the original position. The automatic high beam indicator will turn off. 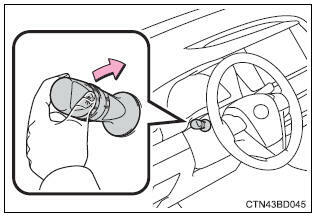 Push the lever away from you to activate the automatic high beam system again. Press the automatic high beam switch. 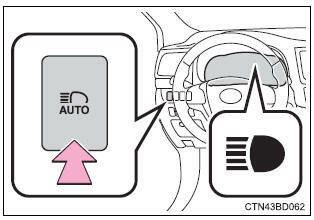 The automatic high beam indicator will turn off and the high beam indicator will turn on. Press the switch to activate the automatic high beam system again. The engine switch is in ignition on mode. high beam may be turned off if an oncoming vehicle that is using fog lights without using the headlights is detected. House lights, street lights, red traffic signals, and illuminated billboards or signs may cause the high beam to turn off. high beam may be turned on or off when unexpected by the driver. Small vehicles, such as bicycles, may not be detected. In the situations below, the system may not be able to correctly detect the surrounding brightness levels, and may flash or expose nearby pedestrians to the high beam. Therefore, you should consider turning the high beams on or off manually rather than relying on the automatic high beam system. The windshield is obscured by fog, mist, ice, dirt etc. The windshield is cracked or damaged. The camera sensor is deformed or dirty. Surrounding brightness levels are equal to those of headlights, tail lights or fog lights. Vehicles ahead have headlights or tail lights that are either switched off, dirty, changing color, or have improperly adjusted aim. When driving through an area of intermittently changing brightness and darkness. When frequently and repeatedly driving ascending/descending roads, or roads with rough, bumpy or uneven surfaces (such as stone-paved roads, gravel tracks etc.). When frequently and repeatedly taking curves or driving on a winding road. There is a highly reflective object ahead of the vehicle, such as a sign or a mirror. The vehicle's headlights are damaged or dirty. The vehicle is listing or titling, due to a flat tire, a trailer being towed etc. The driver believes that the high beam may be causing problems or distress to other drivers or pedestrians nearby. The sensitivity of the sensor can be temporarily lowered. Turn the engine switch off while the following conditions are met. The headlight switch lever is in high beam position. Automatic high beam switch is on. Turn the engine switch to ignition on mode. Within 5 seconds after 2, repeat pulling the headlight switch lever to the original position then pushing it to the high beam position quickly 9 times, then leave the lever in high beam position. Automatic high beam (headlights) may turn on even the vehicle is stopped. It may indicate a malfunction in the system. Contact your toyota dealer. Do not rely on the automatic high beam. Always drive safely, taking care to observe your surroundings and turning high beam on or off manually if necessary. Observe the following to ensure that the automatic high beam functions correctly. Do not touch the camera sensor. Do not subject the camera sensor to a strong impact. Do not disassemble the camera sensor. Do not spill liquid onto the camera sensor. Do not apply window tinting or stickers to the camera sensor or the area of windshield near the camera sensor. Do not install a parking tag or any other accessories near or around the camera sensor. Do not modify the vehicle. Do not replace windshield with non-genuine windshield.